Just 100 metres from the Kittery Premium Outlets shopping centre this Kittery motel offers free WiFi access and rooms with a TV. The Portsmouth New Hampshire town centre is 10 minutesâ?? drive away. Cable channels are included with each air-conditioned room at Coachman Inn which provides an in-room desk and fan as well. All rooms offer a hairdryer and free toiletries in the en suite bathroom while certain rooms also boast a spa bath. 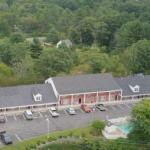 A 24-hour front desk welcomes guests to the Kittery Coachman Inn. A shared lounge is available for guests who also have access to a games room. Free parking is provided. Nubble Lighthouse is 14 km from Coachman Inn which is only 11 minutesâ?? drive from Fort Foster. Portsmouth International Airport is 12 km away.